GET YOUR FINANCIAL LIFE IN ORDER. 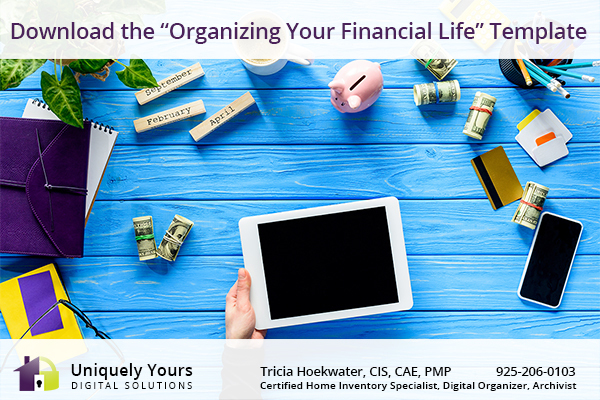 DOWNLOAD THE TEMPLATE NOW: http://uniquelyyoursdigitalsolutions.com/Organizing-your-financial-life-template.docx. NEED HELP GETTING YOUR FINANCIAL LIFE IN ORDER? Tricia can get you started or complete the task for you. Contact Tricia today at 925-206-0103 or via email uniquelyyours@outlook.com to schedule an appointment. Have a home inventory that is up-to-date? A home inventory is part of your lifelong financial plan. Contact Tricia via phone at 925-206-0103 or by email uniquelyyours@outlook.com to schedule your home inventory today.